Knowing the distance to the green is critical for determining club selection for either laying up or landing on the green. Knowing the distance to the green is key for any golfer. Club selection, the type of shot taken and the power of the swing all hinge on that number. Golf courses typically provide golfers with markers, either plates in the ground, colored sticks or small tabs on sprinkler heads. But most common is the painted plate in the ground, and knowing what each color means can help a golfer hit the perfect shot. Golf courses move holes around on the green to increase difficulty of play and make the course different and more challenging each time a golfer plays a round. If ground markers were to give the distance to the hole, they'd have to be dug up and moved regularly. Instead, courses generally measure to the center of the green. This is important to remember, because the hole position can mean a difference of 20 to 30 yards on some shots. 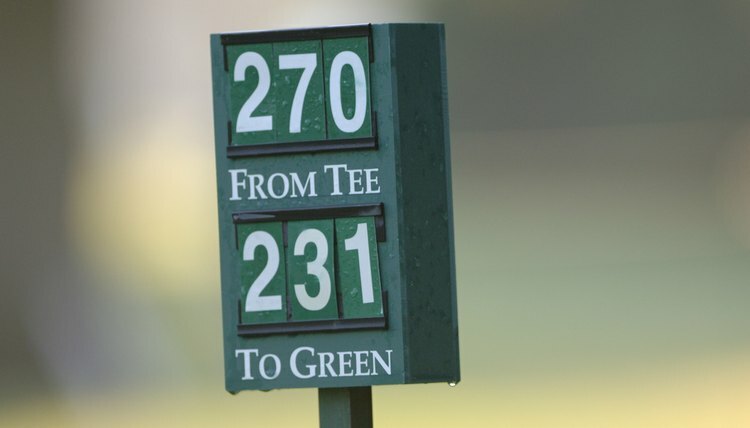 The 200-yard marker is the first a player may come across, typically on par 5s and some longer par 4s. It is typically painted blue but can sometimes be black or another color if the course desires. The 150-yard marker is found on every hole longer than a par 3 and are pretty much always painted white. Because most players can reach the green with their next shot from 150 yards, some courses make extra effort to highlight the location of the 150-yard marker. These include a white stick or a tree planted on the edge of the fairway. The 100-yard marker is usually a welcome site to any player because the green is near and just a short shot away. It's usually red and found on all par 5s, par 4s and longer par 3s. Like the 150-marker, golf courses will sometimes make the 100-yard marker more recognizable by adding a red stick or planting a tree on each side of the fairway to draw attention to it. While the 200-, 150- and 100-yard markers are found on pretty much every course, some will give players even more information about distance. Sprinkler heads are everywhere because watering is necessary to keep the course in playing condition. Many courses put a plaque or write the distance on the sprinkler head. As with the main yardage markers, distances are generally to the center, although some courses will list the distance to the front, center and back of the green on the same sprinkler head. Bryan Rose is an experienced journalist and web writer, spending nearly 12 years in the publishing industry. Rose works for a variety of Demand Studios websites, writing mostly for ehow.com and Golflink.com. He holds a Bachelor of Arts in History degree from the University of Wisconsin.